Spring is here and it is finally warm enough in Arizona to start wearing open-toed shoes, which means I can finally start rocking some nail art on my toes! Since the rest of the states will thaw soon, I will help kick start your imagination with some water marble nail art for your toes. One may think that water marbling is difficult on your fingernails, let alone your toes. 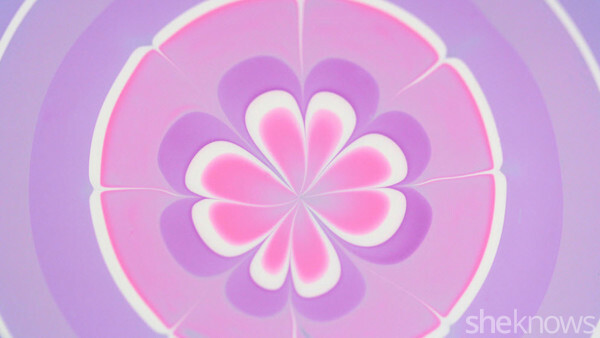 But, I’m about to show you an easy and do-able spring water marble design, just for your tootsies. You will want to prepare a glass of water in advance. When water marbling, you want the water in your glass to be at room temperature. Since no one is perfect, I recommend leaving several glasses, or even a pitcher, of water out on your kitchen counter for a couple hours to make sure you have plenty available when you finally start your design. Another quick tip: Cups with a smaller diameter will be easier to work with. When water marbling, be sure to use highly pigmented (opaque) and fresh (or thinned) nail polish. This is important because old or gloopy nail polish will not spread out on the surface of the water very well. Keep all the polishes you’ll use within reach and their caps open so you can work faster. Before you start dripping you’ll want to turn any heat/air conditioning off, as well as any fans. Blowing air will dry the polish quicker than you’ll be able to draw your design on the water’s surface. For my design I used three nail polishes, but you can use as many as you desire. The patterns created with this technique are quite random and experimenting with colors is part of the fun. 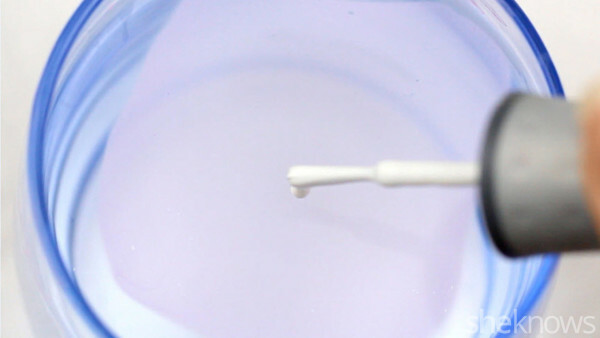 Place a drop of your first nail polish into the water in the middle of the cup. The closer you keep the brush to the water the better; you can even touch the water with the polish droplet itself. If you hold the brush too high you risk the drop not dispersing on the surface and falling to the bottom of the glass. If your nail polish is spreading out too slowly then you can shake the cup a little to help it out. Additionally, if the polish doesn’t spread to the edges of your glass you can run a Q-tip around the outer edge to help the polish spread. Repeat this process with other colors by placing the new drops in the middle of the glass, inside the previous drops that have already spread out. 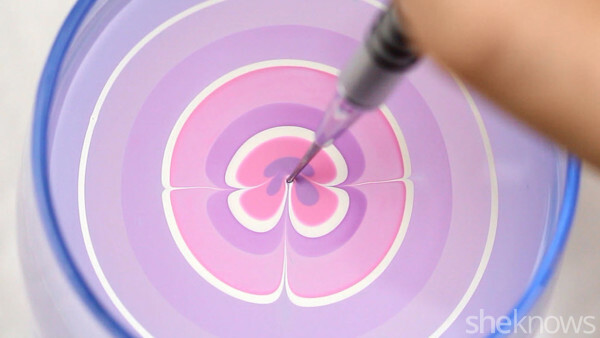 A ringed pattern will emerge and you can continue adding drops to the cup until the innermost circle is relatively small. You’ll want to move fast during this process as time saved here will give you more time to design before your polish dries. 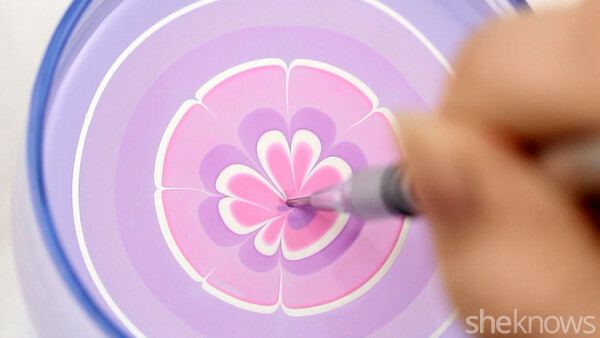 After you’ve finished your nail polish “slick” on the surface of the water you can now use a water marble tool, or a needle or toothpick, and start dragging it through the water. Be careful of the outside rings; they could be dry already and dragging your tool through them could ruin your design. You may want to start your tool in the third or even the fifth rings from the outside. Drag your tool from the outside in to the center from various points on the edge to create a flower pattern in the middle. Be sure to clean your tool with a paper towel between uses to keep the design neater. Dragging polish to the center of your glass will move polish from the outsides to the center, so if your design looks messy you may want to try dipping and removing your tool into the center to remove excess polish. This little trick can really save you from restarting the whole process if you’re getting frustrated with how your flower looks. Once you’re happy with your flower, set it aside and leave it alone for 30 minutes to dry completely. While you’re waiting for your water marble design to dry, you can now prepare your toes. Always start by protecting your nails with a quality base coat. After your base coat is dry, apply two layers of white nail polish to your big toes. The white will help the water marble’s colors to stand out more. Apply two layers of a complementary color to the rest of your toes. If the water marble design is dry, remove it from the water using a finger or wood stick. Be very careful to not wrinkle the sheet as it could ruin the design. Using small scissors, cut out a desired piece of the design about the size and shape of your big toenail. It doesn’t have to be perfect. Apply topcoat on your big toenail and carefully place your cut-out design on the nail. 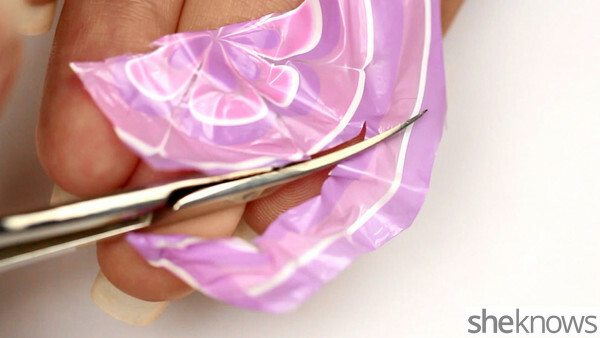 Gently push it and seal the piece onto your nail, paying special attention to the edges near your skin. Your cutout will not be perfect, so pour a little acetone into a small dish and use a flat brush to clean up the edges. 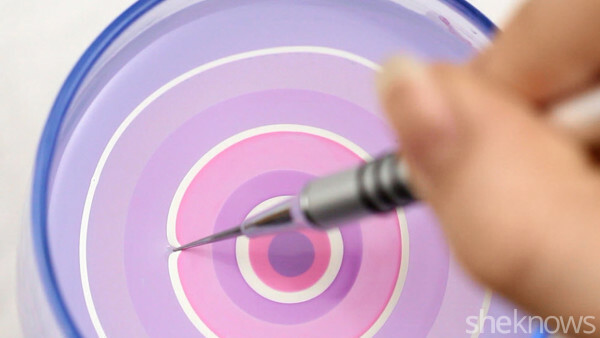 Dip the flat brush in acetone and use it on your skin to dissolve the excess water marble design. Be very careful to not touch your nail while doing this, as it will ruin the design. After you’ve cleaned up your design, apply a layer of top coat to seal your design. Enjoy your new water-marbled toes! I loved this design so much after I finished it that I needed to take them for a walk in the pair of wedges I got from Nordstrom last week. Pictured are my newly marbled toes in a pair of Jules by UGG Australia.